Doug is the youngest son of the owner of Bridgewater Motor Works. Much of his life has been spent at Bridgewater Motor Works and today, he still contributes as much time there as anyone on staff. Born and raised in the area, Doug graduated from Bridgewater Raynham Regional High School in 1995. Like his father, he loves automobile racing. Doug was the core component in the success of the Bridgewater Motor Works racing team when they fielded a BMW in the 1990’s. 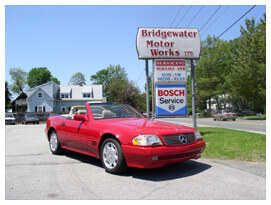 Doug has been employed by Bridgewater Motor Works since 2004, with a focal point on tires. Some of the team members call Doug “the master of the hunter road force tire machine”.